In the northwest of the department, is the Pays Toulousain, with its pink city at the centre, which shines from its culture and booming activity all year round. This land is punctuatedby the Garonne River, which offers fertile plains, neighbouring green hills, small farms and charming villages. “O mon Païs, O Toulouse” (oh my country, oh Toulouse), Claude Nougaro the famous French singer with his eponymous song describes the atmosphere and the heritage of the pink town. This hymn to the Gascony City is a true love song. The lyrics of the song resonate between the walls of the capitol and can be read on a plaque on the Garonne River banks. 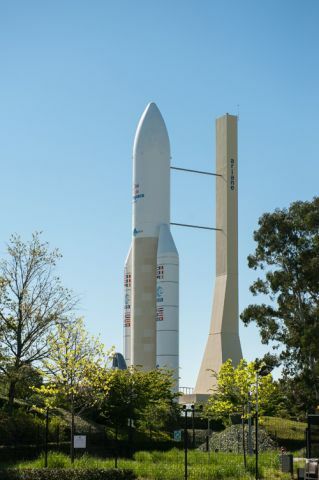 With its universities and its cutting edge aeronautics industries, the capital of Occitanie has a dynamic side that completes the picture of a city listed in the first tier of French cities where the life is pleasant for its 458,298 inhabitants. Labelled “Ville d’art et d’histoire” (Town and Country of Art of History : Since 1985, the Ministry of Culture and Communication has ensured that a policy of valuing heritage and raising awareness of architecture has been implemented. The label "Town and Country of Art and History" refers to the territories, villages or groups of villages which, aware of what is at stake by the appropriation of their architecture and of their heritage through their inhabitants, are involved in an active approach to knowledge, conservation, mediation and support and to the quality of architecture and environment. ), Toulouse has established the French record for the number of 16th century private residence (thanks to the pastel trade which made the fortune of many traders) and it is very pleasant to take the time to wander in the old narrow streets of its historic centre and to discover the red brick facades of these beautiful buildings. It is easy to move around with its two metro bus lines and its two tramlines. The Garonne River is the soul of the city and was instrumental in the development of Toulouse. It is nice to wander along the canal du midi, listed Unesco World Heritage site, and the banks of the Garonne River. A Tourists city, Toulouse is not far from the Pyrenees ski slopes, the Atlantic Coast and the Mediterranee. This is a lively square where the Toulouse inhabitants like to meet at a coffee shop terrace, celebrate big events or simply wander. At the centre of the square, a huge bronze Occitan cross is the work of the artist Raymond Moretti (1931-2005). 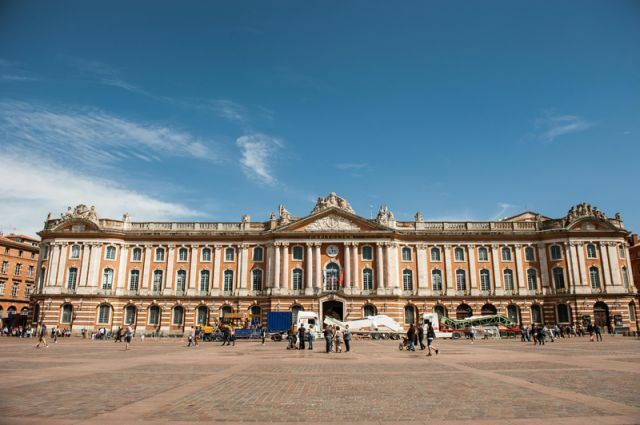 The square shelters the Capitole, a pink brick and white stone monument, which was the headquarters of the municipality and where its members the “capitouls sat from 1190 until 1789. Its façade, 130 metres long (426 feet) is decorated by eight pink marble columns, symbol of the 8 capitouls of the city and the statues. Its interior court displays a statue of the King Henri IV, the only one sculpted when he was alive. A plaque indicates that it is at this place that in 1632, the Duc of Montmorency was beheaded after revolting against Richelieu. Close by, the Charles de Gaulle square houses the donjon of the Capitole where a red brick, tower was the former communes archives. The donjon was refurbished by Viollet-le-Duc at the beginning of the 19th century remodelling its turrets and giving it the appearance of a Flemish bell tower. 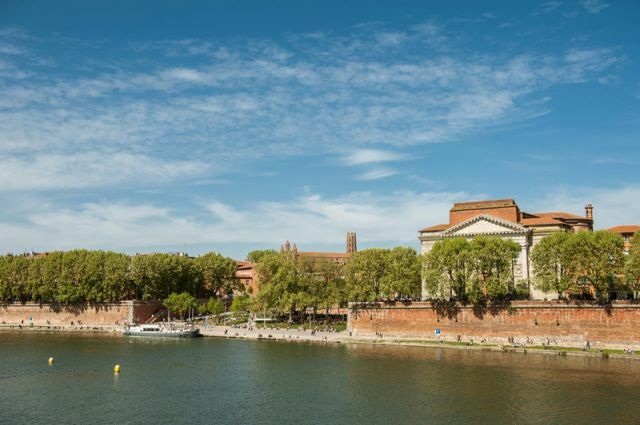 Not far from the Capitol, the Museum of the old Toulouse, recalls the history of the city through the collection of paintings, sculptures and period documents. 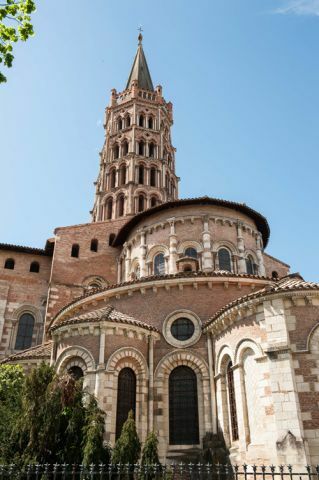 Built from the 11th century, on the site where the first Bishop of Toulouse was martyred first, it is the biggest and the best preserved of the Roman Churches. Over the centuries, the church has undergone successive restorations, especially the one by Viollet-le-Duc. It is a blend of stone and bricks creating perfect harmony. With its octagonal bell tower rises up to 65 metres (213 feet). 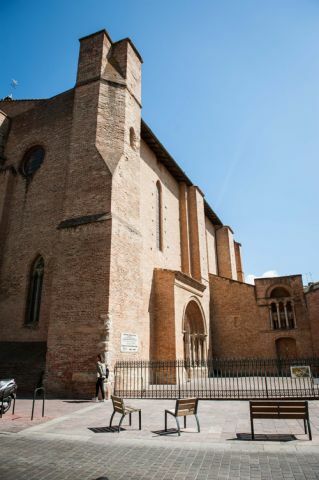 The Saint Sernin Basilica is a major stopover for pilgrims on the Santiago de Compostela road. Several gates provide access to the basilica such as the Roman tympanum Miègeville Gate, the Counts Gate with its many sculptures. The building is characterised by its 5 traditional naves of a pilgrim church and is 115 metres (377 feet) long by 21 metres high with a vaulted ceiling. Close by, the Saint Raymond museum, installed in a 16th century building is dedicated to the art and archaeology of the Antiquity. Close by, the Rue du Taur, is one of the most pleasant ones of the city. The Notre-Dame-du-Taur Church possesses a 40 metres high (131 feet) bell-gable. A few steps away from Rue du Taur, the Gothic style Carmelites chapel is the unique vestige of a convent built in the 17th century. Its 30 metres (98 feet) long nave is divided in 4 spans with a cant apse. Many paintings, taking their inspiration from Michel Ange and that we owe to the painters of Toulouse Pierre Rivals and Jean-Baptiste Despax, cover the ceiling and the walls. One of the heritage treasures of the city: a church and a cloister. The convent was built between 1230 and 1350 for the Dominicans, a beggar and preacher order, who settled in Toulouse to fight the Catharism. The church went through successive periods of restoration. A masterpiece of the Gothique Languedoc Art, its exterior style is large and minimal, inside is a huge space and a more elegant architecture 28 metres (91 feet) high with 7 columns carved to represent stone “palm trees”. The altar houses the relics of the Saint Dominican Thomas d’Aquin (1225-1274), theologian and philosopher. The majority of the stained glass windows are not original and date from 1955. 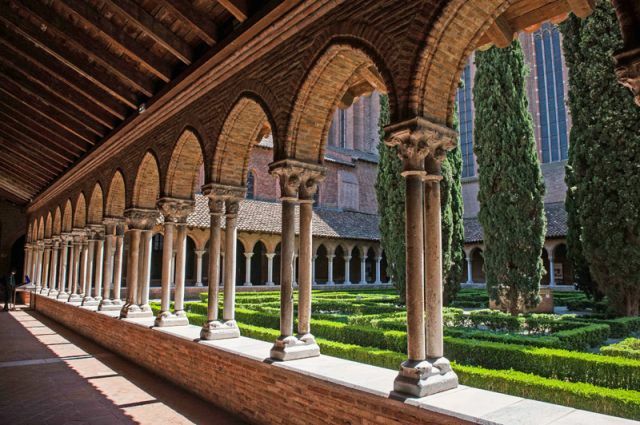 The cloister and its garden are a piece of heaven in the heart of the city where you can wander and admire the pillars caped with carvings of flowers or animals. During the summer a series of concerts take place in the gardens and during the autumn the Piano Festival takes place in the Capitular hall. From the cloister, we can admire the 45 metres (148 feet) bell tower. The refectory hosts temporary exhibitions. Few steps away from here, the Saint-Antonin chapel exhibits 16th century tempera (egg base) paintings. 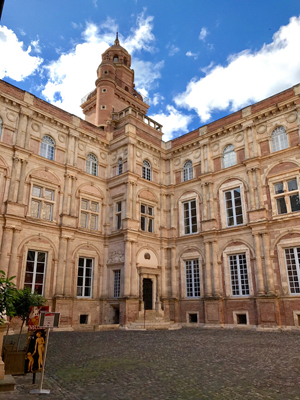 One of the most beautiful private Renaissance residences in Toulouse; It belonged to Jean de Bernuy, a Spanish trader who became rich thanks to the pastel trade and became “capitoul” (The “Capitouls” were the chief magistrates of the commune of Toulouse during the late Middle Ages and early Modern Period. Their council and rule was known as the Capitoulate. They were suppressed in 1789 amid the French Revolution. ) in 1532. The residence is organised around the two interior courts. Today the building houses the College (secondary school) and Lycée (high school) Pierre de Fermat. The Rue Alsace Lorraine is dedicated to pedestrians and cyclists; this shopping street is very busy. 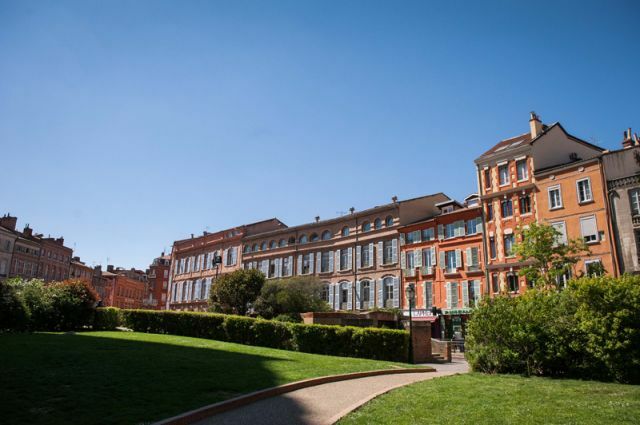 It crosses the city from north to south, it is one of the biggest Haussman style roads in Toulouse. Perpendicular, the Rue de Metz is also a shopping street. Nearby, the Augustins Museum is a former monastic complex, which welcomed the hermits of Saint Augustin during the 14th and 15th century. A museum since 1793, it harbours today a collection of paintings and sculptures dating from the Middle Ages to the 19th century. Its cloister is a treasure of the Gothic Art. The Arnaud Bernard quarter has remained a popular quarter. For decades, it held an open-air market and then later a covered market. Concerts often take place on the square which was restored in the nineties. In Rue Gramat, graffiti artists created a mural painting. A few minutes from the quarter, the Compans-Caffarelli gardens offers on tens of hectares, a zen garden with Japanese botanical varieties. It is pleasant to walk along the banks of the Garonne River, across the city. The new Saint-Pierre Square, restored in 2016, offers a vast esplanade where pedestrians, cyclist, joggers enjoy the space. The Saint Pierre Bridge which spans the Garonne River is a copy of the Pont Alexandre III in Paris. The embankments of the right bank offer a pleasant walk and a way to admire the beautiful facades from the 18th century. During the walk, you can discover the Saint Pierre-des-cuisines Church, which was at first a funerary basilica during the 4th century, then modified through the centuries to be transformed into an auditorium. Going up, the Saint Pierre des Chartreux Church can be seen with its imposing slate dome and its lantern topped by a statue of Saint Jean Baptiste. The Bazacle took its name from the Gué which used to cross the Garonne River. The first mills were built here. It is today an hydroelectric station, partly open to the public. Just before, starts the canal de Brienne which crosses with the canal du Midi and the Garonne River. 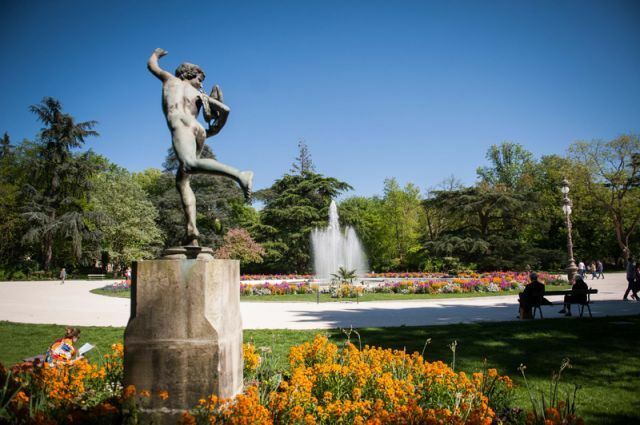 Like the Canal du Midi it is a listed Unesco World Heritage, it is bordered by centenary plane trees and possesses two remarkable works: The Saint-Pierre lock and the Port Embouchure decorated with a Carrare marble bas-relief. Heading towards the city, we arrive on Place de la Daurade, full of charm and popular with the locals and visitors. The Quai de la Daurade allows you to reach Pont Neuf, the building of which building took 100 years. The Basilica Notre-dame de la Daurade, owes its name to the first basilica decorated with golden mosaics. It is famous due to its black virgin that is said to have great powers for pregnant women. The Quai de Tounis, was built as a flood defence against the river and is bordered by imposing buildings. The Church of Notre dame de la Dalbade, situated in the Quartier des Carmes, has been named after the white lime plaster covering the building. Destroyed by a fire in 1442, it was rebuilt at the end of the 15th century. 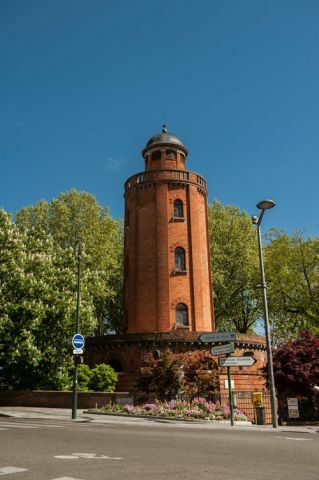 Its tower bell was for a long time the highest in the city at 91 metres (298 feet) tall and collapsed suddenly in 1926. The church is also noteworthy for its ceramic tympanum, unique in Toulouse, illustrated in 1878 by Gaston Virebent who was inspired by the Crowning of the Fra Angelico Virgin. On the left bank of the Garonne River, is the Quartier Saint Cyprien. Historically it was the area of the city the most exposed to flooding and was home to the poorest communities . Today, this popular quarteris vibrant and very trendy. Also in this area is the Raymond-VI Garden, a modern garden next to the museum, overlooking the river. The Prairie des filtres, a landscape garden, previously marshland, became the natural lungs of the city. 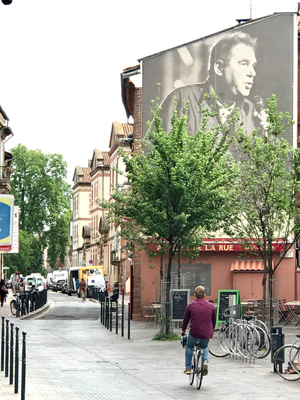 The Carmes is a vibrant quarter and a shopping area. On its eponymous square is a car park, where a 12th century convent, destroyed during the 19th century and much later a Baltard style covered market destroyed in 1963, once stood. Beyond the Esquirol Square, where Roman ruins of the old Tolosa (Roman name for Toulouse) were discovered during the construction of the metro, you enter the popular Toulouse of the Middle-Ages, with its artisans boutiques, which are today homes and where street names remind us of the past. The Place du Parlement houses the Seilhan House, named after the creator of the Dominican order in 1217. This religious order still lives there. Few steps away, the Rue de la Fonderie houses the Georges Baccrabère Museum, which exhibits a part of the Gallo-Roman fortifications from the Late Roman Empire, sculptures and funerary elements. The quartier Saint Etienne is the antique dealers quarter, beautiful Renaissance private residences can be admired. The Saint Etienne Cathedral was built during the 12th century. The building combines two gothic styles: the southern gothic style, solid and mighty and the northern gothic style, slim and light. Pierre-Paul Riquet, famous designer of the Canal du Midi is buried there. In Rue de la Pleau, the Paul Dupuy Museum housing collection of graphic and deco arts. The shady banks of the canal du midi are an ideal place for a walk or a bike ride. It was Pierre-Paul Riquet (1604-1680) who had the idea to dig a junction canal between the Atlantic and the Mediterranean and managed to sell the project to Louis XIV. In 1681, after 15 years of titanic construction work, the 240 km (149 miles) of the Canal du Midi inaugurated, they link Toulouse (from the Port de l’embouchure) to the Etang de Thau, close to Sète. 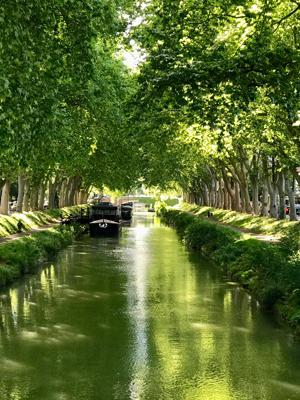 Since 1996, the canal du Midi is listed Unesco World Heritage. It is well used by the enthusiasts of river cruises. Toulouse has, right in its town centre, 160 squares, parks and gardens, hundreds of green spaces offering relaxing spaces which are real peace heaven… Jardin des Plantes, Boulingrin Garden, Royal Garden, Sesquières Park stretch on 117 hectares (289 acres) around a large water lagoon and a leisure centre, Parc de Pech-David Park, green zone of 270 hectares (667 acres) with rural paths, forests and leisure centre. There is no lack of cultural events in the pink city. Toulouse has a network of concert halls: Théâtre-opéra du Capitole, Temple Historique de l’Art Lyrique ; Théâtre National du Toulouse, la Cave Poésie, salle mythique, Théâtre Garonne. The Cité de l’espace (City of Space) is undoubtedly the most visited site of Toulouse with its 2,500 m² exhibitions and its 5 hectares gardens, Its IMAX 3D cinema on giant screen, its planetarium, its simulators, its Terr@dome, its weather centre, its maze of galaxies or its astronomy dome… discover space and its Universe of treasures. From November 2016 to May 2017, Thomas Pesquet, French astronaut from the European Spatial Agency, accomplished its first mission of 6 months on board of the ISS, an event that was shared from the City of the Space. Open since the end of 2014, the Aeroscopia Aeronautic Museum presents an exceptional collection of aviation treasures. The Clément-Ader Museum, in Muret, named after the father of the aviation, paying tribute to the pioneers, or the Cap Al Campestre Museum, Art and popular traditions museums, created by passionate people and tracing back the countryside and city life from 1900 to 1960, in reconstituted exhibits. 18 kilomètres (11 miles) from Toulouse, the African Safari zoo, offers an immersion at the heart of Africa where many animals live in a very shady park. Finally, not to forgot the pride of Toulouse: the rugby, because we are in the land of Ovalie. The Stadium of Toulouse is one of the “monuments of the city”. Toulouse is the centre, but not the only point of attraction of the Pays Toulousain. We invite you to discover the towns and villages of this land. Grenade is very well located, between Toulouse, Montauban, Albi and Auch andhasa great cultural activity. It is a bastide created in 1290, with the Save River to the westand the Garonne River to the east. The central halland its 36 pillars, which is one of the biggest covered hall in France, hosts many events, in particular the weekly market (one of the most beautiful of the region) on Saturday mornings. Gothic churches, dovecots and half-timbered housesarethe trademarks of this town with parallel lines of long and straight avenues. Visit the old Ursulines convent, an historic monument with permanent exhibitions on the town’s history. 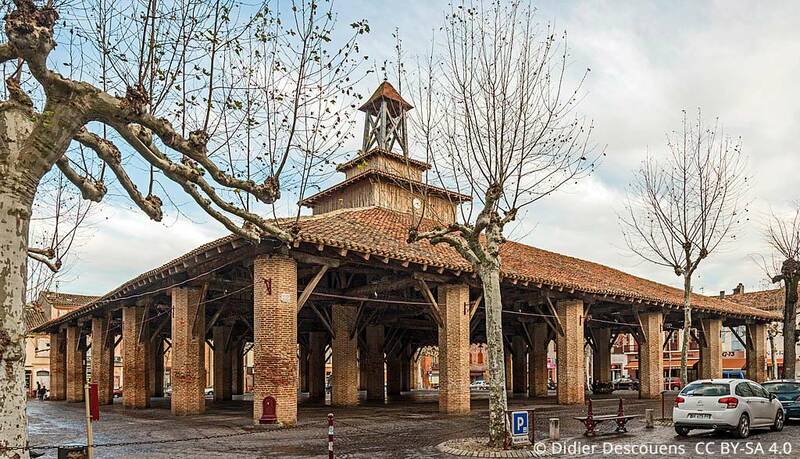 The Gothic style Notre-Dame de l'Assomption Church and its beautiful orthogonal bell, recalls the Toulousain buildings...Do not miss the Pont de la Save, a brick bridge dating from the14th century. •During summer, try the Petit Train de Grenade, it’s free! Relive your childhood and builda fabulous memory. •Is it raining? Go to Pitchoun Parc for indoor activities. At the border of the department of Tarn-et-Garonne, is Fronton, which name invokes subtle flavoursfor wine enthusiasts. The landscapes of the commune are mainly composed of vines, but Fronton has few surprises, on the top of its renowned wineries. The church is listed historic monumentand has an interesting collection of furniture. The wine of Fronton is an AOP (Protected Designation of Origin),it is one of the oldest vineyards plantedby the Romans, which resisted to the 19th century phylloxera, thanks to the care of the winemakers. 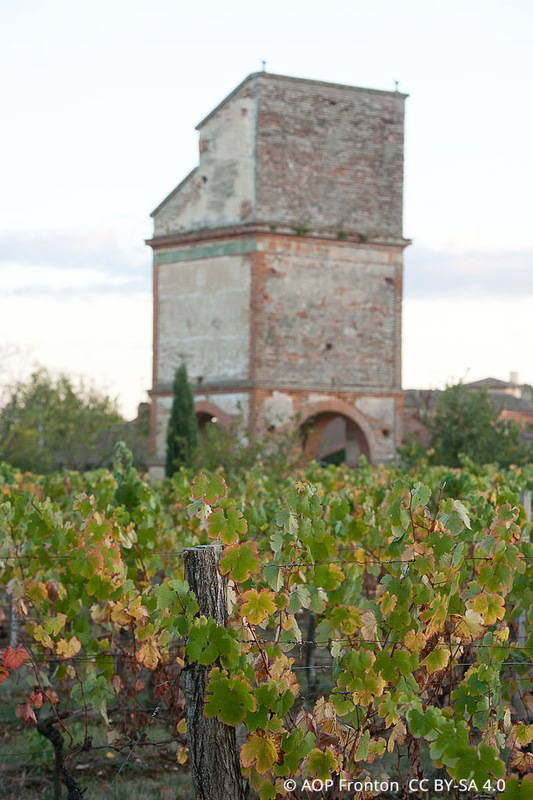 It is sometimes called the wine of the Toulousains, as it is the vineyard the closest to the pink town. The red wines (65% of the production) and rosés (35%) are elegant and flavoursome. •Would you like to visit a vineyard? There are several in Fronton, but if you are a rosé fan, go to Vinovalie, their rosé was voted the "best in the world" in 2007. •The Maison des Vins et du Tourisme (The house of Wines and Tourism) of Fronton, is located in the Capdeville Castle, a superb residence, surrounded by a 7 hectare park. Tastings are organised by professionals every month and daily / weekly during the summer. •Enough of wine?? For fresh air go for a tour in the vineyards by quad, with Rando Quad Aventure. •For family fun during the summer, the swimming pool Aquatica is open. Colomiersis located in the urban area of Toulouse. It is the second most populated commune in the department. It is an economic and dynamic hub, with all the amenities and urban fun: bowling, cinema, performance venues, bars and discos. It is an interesting anchor point for your holidays in the Toulousain country. There are two parksin the commune: The Parc du Perget and the Parc du Selery where you can see many blossoming cherry trees during spring. •For an unusual visit, in Bessière, Eco notre, a waste recycling plant that is open to the public. •La Réole Castle located in the town of the same name, is a beautiful Renaissance castle with a minimalist façade.